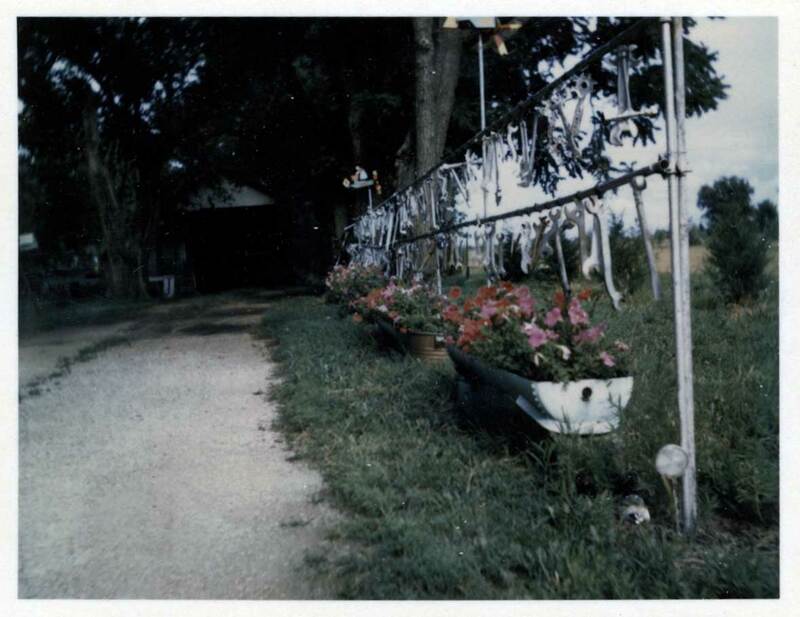 Though I barely remember it, Grandpa had a many-splendored front yard at his house in Lindsborg. There were many painted concrete animal statues, whirligigs and he also had the wrench fence. I recall they clanged splendidly in the great plains wind (at least to my five year old ear). When I was scanning this photo this evening I noticed for the first time there are also two of the aforementioned Reuben Strange whirligigs mounted atop the fence. Eben Johnson’s Fence. Lindsborg, Kansas. c. 1970. 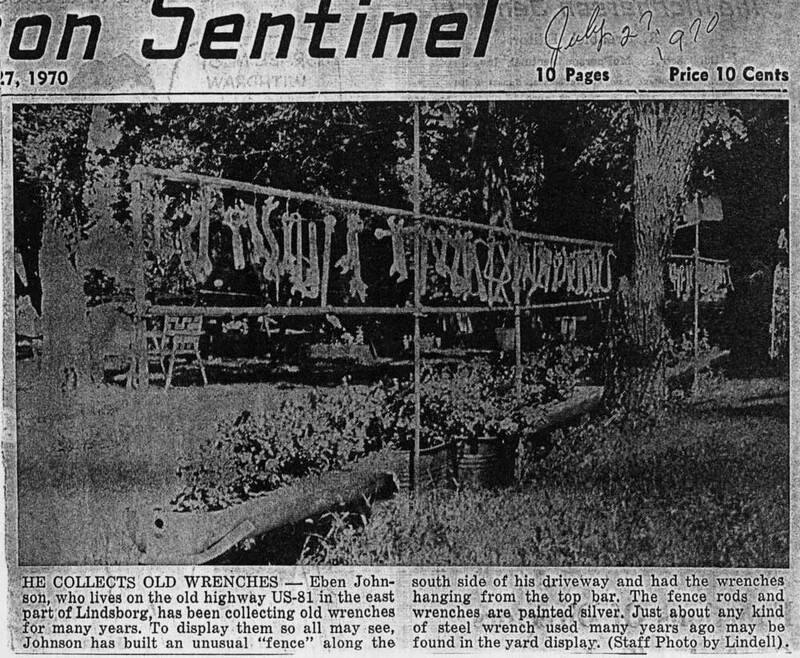 Eben Johnson’s fence as featured on the front page of The McPherson Sentinel, July 27, 1970. Thanks to Mike Rodriquez at All the Pages Are My Days blog, the unknown toymaker (to me) has been named. 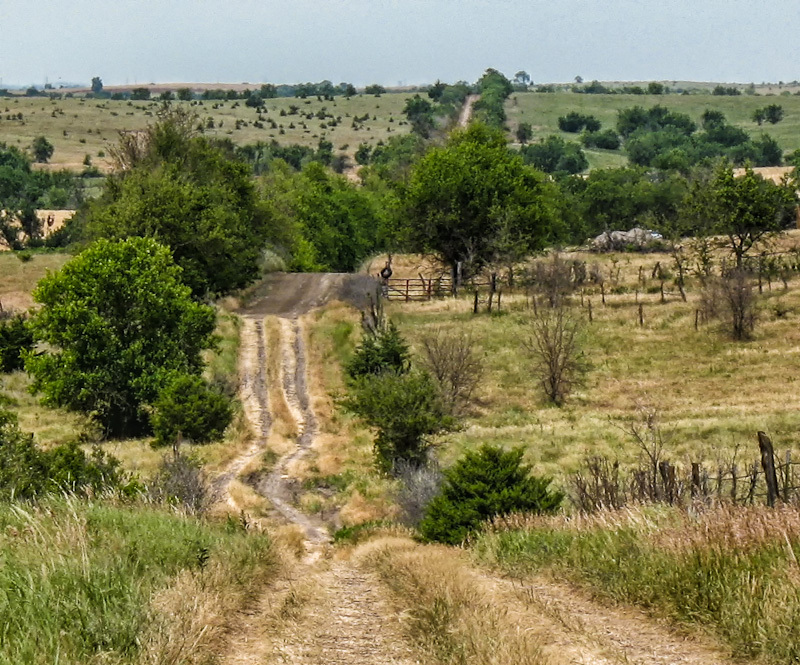 And thanks to Mike for a perfect picture of a road on which I spent many a happy hour riding upon growing up. My Mom and Dad still live less than two miles from where this photo was taken and when ever I visit home my wife and I never miss an opportunity to take the short walk up that way. See also some of his splendid images from Kanopolis Lake and Horsethief Canyon, another destination dear to me. 19th Avenue, looking north. McPherson County, Kansas. Photo by Mike Rodriquez at All the Pages Are My Days. I’ve written a bit about Lester Raymer before. 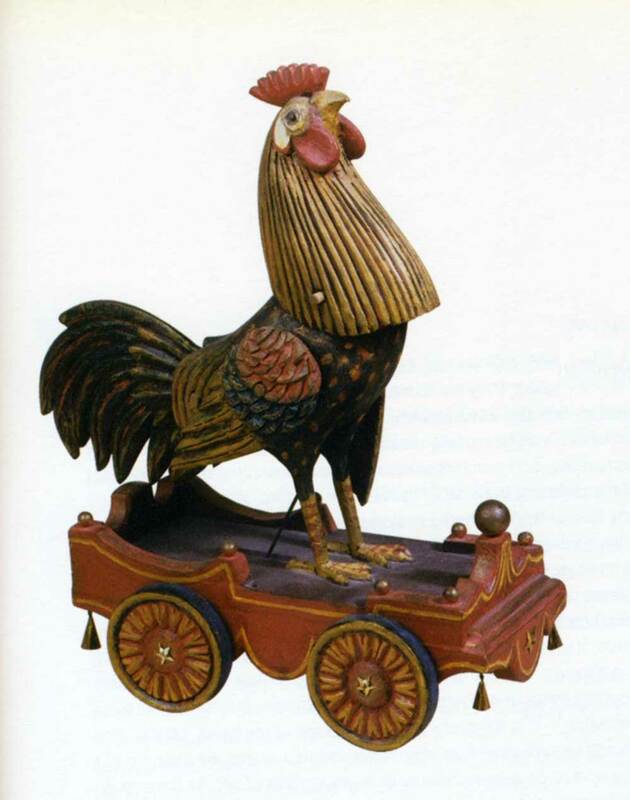 Though his bread and butter was painting, he also had a tradition of making a toy — usually animated — for his wife Ramona every Christmas. Lester Raymer, Roster on Cart with Wheels. 1980.
from Lester Raymer: A Collection of Essays. Published by Red Barn Studio and The Raymer Society, 1998. I’ve had these toys for nearly as long as I can remember. I can recall one occasion when my family and I visited the maker’s shop. I was likely not more than four. All I can really remember is that it was dark, dusty, and wonderful. We had other outdoor objects — whirligigs and the like — now surely lost to weather and time. The materials are quite rough and frugal: mostly pallet wood and related cast offs. These toys now reside my son and daughter’s rooms, high on shelves, as they once did in my bedroom. It really bugs me that I don’t even know the name of the man who made them. Toy made in Lindsborg, Kansas. Maker unknown. Dog pull toy. c. 1979. Toy made in Lindsborg, Kansas. Maker unknown. Dala horse pulling cart and driver. c. 1979. Toy made in Lindsborg, Kansas. Maker unknown. Tractor (detail). Underside of bumper reads “PRODUCE OF U.S.A.” c. 1979. Toy made in Lindsborg, Kansas. Maker unknown. Tractor and trailer. c. 1979. Toy made in Lindsborg, Kansas. Maker unknown. Train and three cars. c. 1979. Toy made in Lindsborg, Kansas. Maker unknown. Train (detail). Stair rail boiler and furniture glide headlight. c. 1979. I’ve had this postcard of Don Weddle’s Ship of Fools pinned to my studio wall for a couple of years. When I walked into Jim Richardson’s Small World Gallery (a wonder in and of it self) I was so pleased to find one of my favorite themes in art in the little town of Lindsborg, Kansas. Don Weddle studied art at Bethany College, The Art Institute of Chicago, and The University of New Mexico. Don is retired from teaching high school art in Wichita and interestingly, was an early mentor to another artist whose work I admire, Tom Otterness. Birger Sandzén, Willow and Cottonwood, linocut, 1931. If you grew up in McPherson County, Kansas as I did, it is likely that Birger Sandzén was the first artist whose style you could confidently identify. His work is in all the schools and in many homes throughout central Kansas. My heart swells with hometown pride when I encounter a Sandzén’s art in major museums throughout the country. Doubtless his work (particularly the prints which I can recall trying to decipher at an early age) continue to influence my own particular artistic choices. Lester Raymer, Promotional card, lino-cut.